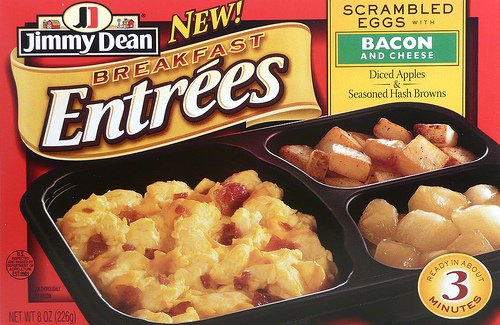 This post is filed under Apple, Bacon, Cheese, Egg, Frozen, Hall of Shame (Taste), Jimmy Dean, Microwave, Potato. On one hand, cholesterol from eggs is not really a problem for healthy people in moderation. On the other hand you have to wonder how much egg is actually in that as compared to cheese, bacon, and gobs o’ soybean oil. Worst of all, it’s superfluous. 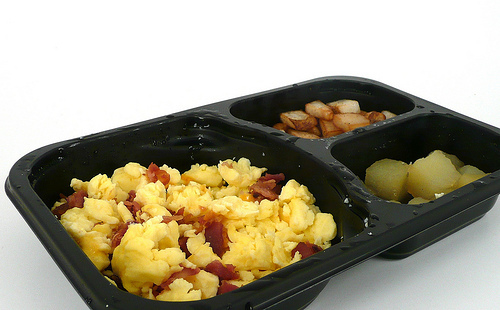 You can make fresh scrambled eggs in the microwave in less time than it takes to nuke this. ew, no thanks. unless i want to die i’m not going to ever touch that. Sad this meal didn’t turn out. But not really too sad – how hard is it to make scrambled eggs with cheese? Seems good, it’s hard to find foods rich in cholesterol these days.